BentoLunch.net - What's for lunch at our house: Theater Snack Bento & News! Theater Snack Bento & News! The girl has theater/dance tonight, so I had to send along a snack, since apparently, she is always starving. I swear I feed her, she's just a bottomless pit (who looks as though she hasn't had a square meal in months). Since she thinks snack = small meal, I opted to pack her a ham and muenster cheese sandwich on honey wheat, cut into teeny squares and skewered on heart picks, an apricot, sliced/pitted in a silicone flower cup, and some carrots. 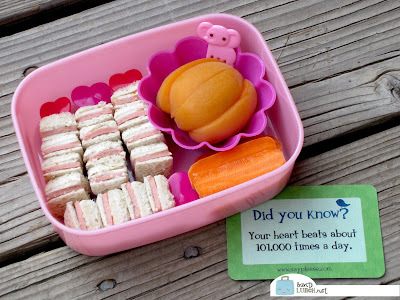 The heart picks were to match our Lunchbox Love note about how often the human heart beats. 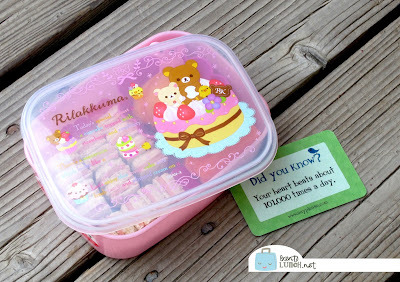 Snack is packed in one of our Rilakkuma boxes, which is from a set of three stacking ones. And my news! I'm really excited to be a part of the Lunchbox Love Mom Panel! Along with 10 other bloggers, I'll be sharing goodies, contests, giveaways and all sorts of lunch making happiness with Lunchbox Love. If you're on Twitter, make sure to follow the hashtag #LBLmoms to see all the latest! That box is so cute!!! So cute! And excited to see what this panel is all about! Congrats!